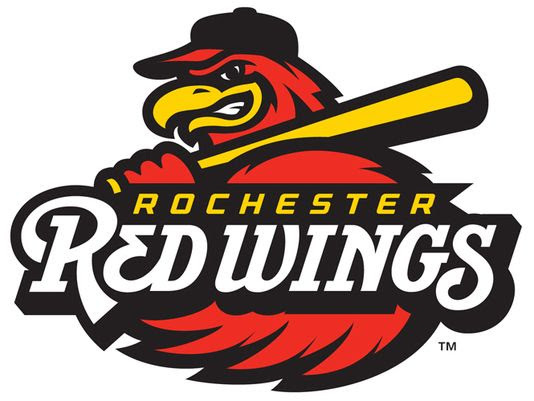 ROCHESTER, N.Y. -- The Rochester Red Wings dropped a 2-1 contest in 10 innings to the Lehigh Valley IronPigs Friday night at Frontier Field. The series continues with a 7:05 p.m. game Saturday (gates open early at 5:30 p.m.), with fireworks after the game. The IronPigs threatened in the top half of the first with the bases loaded after three walks given up by Red Wings starting pitcher, Stephen Gonsalves. Gonsalves worked out of the jam ending the inning with a pop-out. The Red Wings threatened in the bottom of the first after a lead-off double by Byron Buxton against IronPigs starting pitcher, Ranger Suarez. Suarez worked out of the inning, stranding Buxton. The IronPigs scored first in the top of the second after an RBI single from Mitch Walding, making the score 1-0. The Wings threatened again with the bases loaded in the bottom of the second with one out. Suarez set down the next two batters to end the inning. The Wings tied the game 1-1 in the bottom of fourth after an RBI single from Gregorio Petit, scoring Chris Carter. Suarez was replaced with two outs in the bottom of the fifth by Jake Thompson. Suarez finished with 4.2 innings thrown, allowed eight hits, one earned run, two walks and had six strikeouts. Suarez threw 83 pitches, 58 for strikes. Gonsalves was replaced by Tyler Duffey in the top of the sixth inning. Gonsalves finished with 5.0 innings thrown, allowed three hits, one earned run, five walks and had seven strikeouts. Gonsalves threw 94 pitches, 56 for strikes. Tom Windle replaced Thompson in the bottom of the eighth inning. Thompson finished with 2.1 innings thrown, allowed two walks and had one strikeout. Jake Reed replaced Duffey in the top of the ninth inning. Duffey finished with 3.0 innings thrown with five strikeouts. The IronPigs scored in the top of the tenth inning on a sacrifice fly by Adron Chambers, making the score 2-1. The Wings had their scoring chance in the bottom of the 10th inning, but Zack Granite was thrown out at home trying to score on a bunt attempt by Nick Gordon. The Red Wings pitching staff struck out 15 batters. The Red Wings out-hit the IronPigs 9 to3, with every batter but Gordon getting at least one hit. Buxton was 1-for-5 with a double, and Jorge Polanco was 1-for-3 with a walk as part of major league rehab assignments.